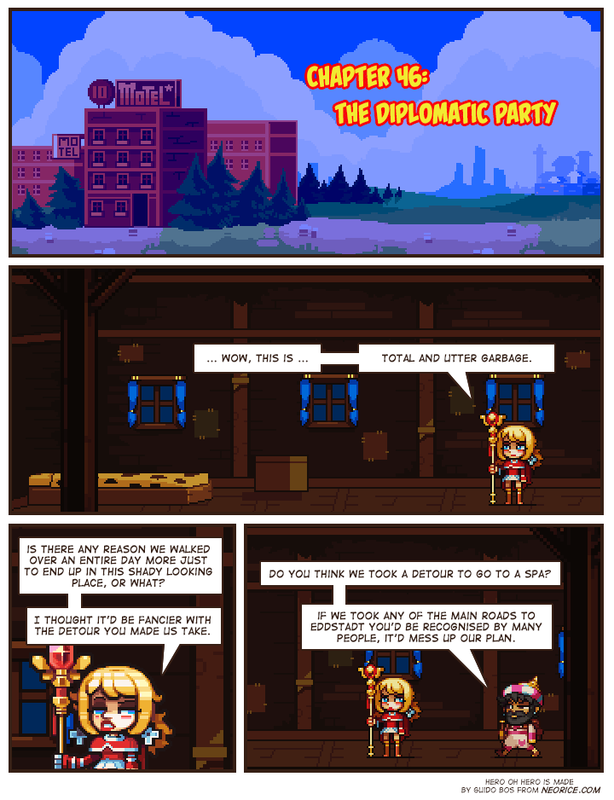 Chapter 46: The Diplomatic Party. And now we return to Pablo's story! Hopefully they've given that other guy the slip. Burk? BURK! BUUUURRRRK!!! My life will have Burk again! Huzzah! Pablo and his sidekick Burk! Wait, is that Burk? Did he shave or what? Beautiful detail, the patched up wall, reminds me of worn out clothes. It seems Piper is not familiar with motels. Nothing fills me with confidence about how things are going to go like calling out "Diplomatic" in the title. The fact this is (100%) Burk's chapter is not helping with that impression. I look forward to the disasters to come. The biggest problem with this comic is that there are now 3 compelling storylines, but only 1 @Neoriceisgood. Does anyone happen to have a pair of cloning vats available? Aw, what? You can't just leave us on that! Man, I do like Burk's story, but now we'll have to wait another 200 or so pages to hear what the paladin was about to say! What are those brown spots on the bedsheets? Please just be a pattern. Oh, boy, our favorite Mage! Burk is my favourite, but I really hate to have a cliffhanger now.